Let’s take a moment right here for a little background, just in case you’re a bit hazy on the details of Judy Garland’s Carnegie Hall Concert. A few bare facts: Judy performed at Carnegie Hall on April 23rd, 1961, with Mort Lindsey conducting a 40-piece orchestra. After an instrumental overture, Judy sang 21 numbers — or 24 songs if you count the songs in the medleys separately — plus 4 encores. The concert was recorded for Capitol records and released as a double album, charted number one on Billboard for 13 weeks, and won 5 Grammys including “Best Female Vocal Performance” and “Album of the Year” — the first live concert album and the first one recorded by a woman to win such an honor. By all contemporary accounts, it was an artistic tour-de-force, with Judy at the top of her game and leaving her audience in a frenzy and clamoring for more. “Iconic” and “legendary” would not be at all hyperbolic to describe it. People who were lucky enough to be there still speak of it as a spiritual experience. Reviews were ecstatic. And then, there’s the music itself, which is what we are actually restoring: 22 song arrangements for orchestra (3 other songs were performed with just Mort Lindsey on piano — maybe I’ll transcribe those, too, stay tuned) plus the overture, written by a gaggle of the greatest songwriters and arrangers of the 20th century. To quote conductor Mort Lindsey, reminiscing about the concert, “…her orchestrations — by everybody — were just as spectacular as you could want. All the songs were very carefully thought out. Each one was a production…” (from Judy Garland: A Portrait in Art and Anecdote by John Fricke). Bringing all of these arrangements back to their former glory is, however, an extremely tall order. For starters, there are a few tunes that the Trust doesn’t have and that appear to be lost. How could this happen?!! Well, if you know anything of Judy’s history, she moved around quite a lot, things got misplaced or misfiled, musicians accidentally took a part home here and there, and several of her arrangements were even impounded during her lifetime and sold at auction after her death. And it seems that people just didn’t value them as much as we do now. MGM infamously discarded its musical library in a landfill circa 1969, and more than a few yellowing manuscripts penned by the great Hollywood and popular orchestrators have been rescued from the curb moments ahead of the trash collector. Of the songs we do have, maybe only a manuscript score survives, or only the instrumental parts but no conductor score, and whole parts may have gone missing or be nearly illegible. They are all hand-written, of course, and some copyists had much neater handwriting than others. (You can see the hurry in which some of the parts were copied!) Microfilmed copies may have so much glare that the musical staff lines are not even visible. “Come Rain or Come Shine,” which was the first of these Garland orchestral restorations I attempted, had no conductor score, cuts that didn’t match up between the parts, and the bongo part had apparently taken a slow boat to Havana. I copied every note, marking, and articulation into the musical notation program Finale to make a full conductor score, then generated the newly-legible instrumental parts. By this point, you are probably thinking that this doesn’t exactly sound like a lot of fun, so why am I so excited about it? Well, since I can remember, I have been in love with Judy Garland’s singing, and also the orchestrations I heard on my Wizard of Oz album and other musicals of the era. 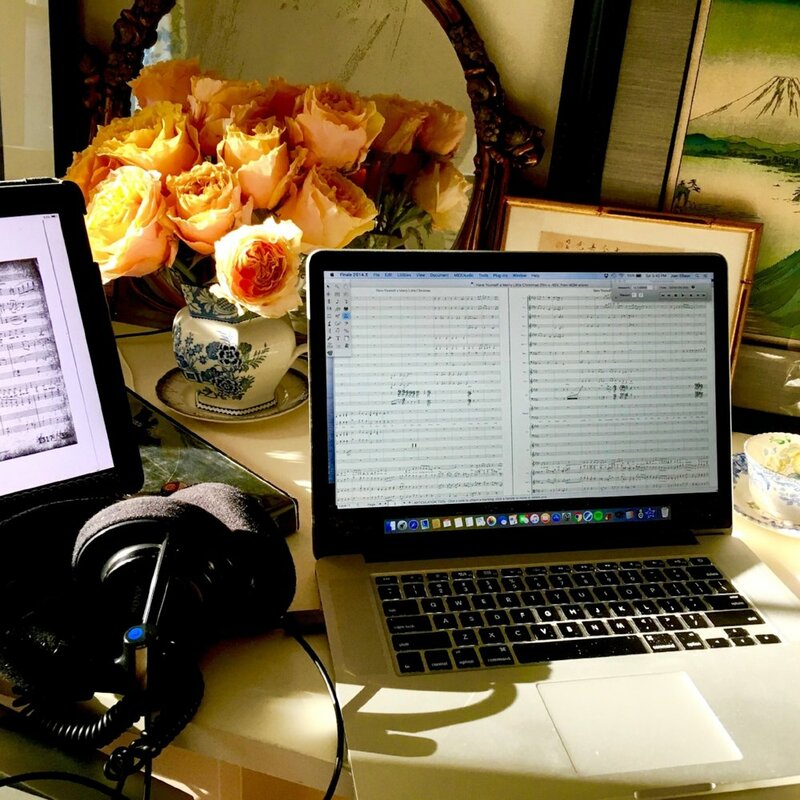 I have been transcribing orchestral reductions and piano accompaniments note-for-note from Judy’s original recordings (some elaboration in this post) for the past twenty years. And now I am getting to bring her actual arrangements back from faded notes on dusty, tattered pages and SING THEM in symphonic surround sound. In my wildest dreams, I could never have thought this up. It seems, paradoxically, both crazy and inevitable that the path would lead here for the toddler who used to sing all the Wizard of Oz orchestral parts. As for orchestration, I have come rather late to the party and that is just one of the reasons I am so humbled and grateful to be given this chance to help preserve Judy’s legacy — a woman who has given me, personally, so much through her artistry. It is a tremendous responsibility and also a great joy to be working with this music and learning firsthand from the top arrangers of the era, including Conrad Salinger and Nelson Riddle. Not to mention getting to play on a team that includes two great storehouses of Garland knowledge, Michael Feinstein and John Fricke — who is also generously supplying music and arrangements from his collection, as well as offering other valuable help. Having written three Garland biographies and produced Garland TV specials for PBS American Masters and A&E, John can answer any question I throw at him and Michael's knowledge is likewise bottomless! Meanwhile, if you don’t see me around as much for the foreseeable future, I’ll probably be at my desk copying charts or transcribing a missing cello or harp part from “That’s Entertainment.” And although they weren't on the Carnegie Concert, you can catch a couple of newly-restored Garland charts on November 26th at The Palace Theatre in Cleveland’s Playhouse Square, when I sing “The Christmas Song” and “Have Yourself a Merry Little Christmas” with the Cleveland Pops. And kids, don't forget to check your grandparents' attics when you're home for the holidays...you just might find one of Judy's lost arrangements!